The rapid sale of the pristine, 680-acre Chadacre estate near Long Melford, Suffolk, for ‘substantially more’ than the £10 million guide price originally quoted by Savills, underlines the lengths to which buyers will still go to secure a ‘once in a lifetime’ country estate. ‘The market for top properties in the right location is very lively at the moment, with five or six serious bidders prepared to throw their hats in the ring, compared with perhaps two or three this time last year,’ comments selling agent Crispin Holborow. This will be music to the ears of the vendors of three quite different country estates that have just been launched on the market. That same energy and search for perfection is evident in every square inch of the immaculate, 934-acre Daresbury estate, near Warrington, Cheshire, (pictured) which Lord Daresbury has built up since moving there in 1980. Once part of the 4,700-acre Walton estate created in the 1850s by brewer Sir Gilbert Greenall (later the 1st Lord Daresbury), which included nearby Daresbury Hall, the estate, decimated by death duties, had shrunk to a 350-acre working farm by the time Lord Daresbury took it on. Over the years, he bought in extra land, transformed the former main farmhouse into an elegant country home, and invested heavily in the stabling, grassland and other equestrian facilities. In this kingdom of the horse, it has been known for unwary house guests who accept a morning invitation to ride to be shown a clean pair of heels by their host as he skips across the estate’s neatly trimmed post-and-railed hedges at a brisk ‘half-speed’. But it’s not all fun and games, for the estate is geared to generate a significant income from a variety of farming and other enterprises, including the annual Creamfields rock festival, which adds a cool £125,000 to the coffers each year. With his eye on the next challenge, Lord Daresbury has decided to move to a larger farm across the border in Wales, where he’s joint master of the Wynn-stay, so his Daresbury estate is for sale through Knight Frank (020-7629 8171) and Strutt & Parker (020-7629 7282) at a guide price of £11.575m for the whole, or in eight lots. The guide quoted for lot 1, Hall Lane Farm, the core of the estate with 380 acres of grassland, arable land and woodland, is £5.95m. It includes Hall Lane Farmhouse, with its eight bedrooms, six reception rooms, swimming pool, tennis and squash courts, and wonderful gardens originally designed by Arabella Lennox-Boyd; the estate offices and twin gate lodges; and the main stable yard with stabling for 18 horses, a horse-walker and an all-weather outdoor manège. Meanwhile, down in Heythrop country, estate-owner Bill Kayley surveys the manicured acres of Broadstone Manor, near Chipping Norton, Oxfordshire, from the back of his high-tech grass-mower. Almost everything at Broadstone is state of the art, from the luxurious, seven-bedroom, Cotswold stone manor house, with its symmetrical parterres and lush green lawns, to the modern office, farm and commercial buildings that together produce an annual income of more than £150,000. Most of Broadstone’s 544 acres of land is arable and pasture land, interspersed with woodland, a series of ponds and a lake, the arable land farmed under a contract-farming agreement, and the pasture grazed by the owner’s herd of South Devon cattle. But now it’s time to downsize, and Broadstone Manor is on the market through Strutt and Parker (020-7629 7282) at a guide price of ‘excess £8m’ for the whole. In total contrast, Grade II-listed Langham Lodge at Langham, near Oakham, Rutland, was once an inn on the salt route from Droitwich to the coast at Boston or King’s Lynn. More recently, the house and its surrounding 343-acre farm, in the heart of Cottesmore hunt country, were part of the Gainsborough estate before being sold to the sitting tenant in the mid 1920s. In 1936, Langham Lodge was bought by the Whadcoat family, who made huge alterations to the house, almost doubling it in size. Unsightly sash windows at the front of the house were replaced by mullioned windows recovered from nearby Exton Old Hall which had burned down. The ancient panelling, doors and staircase were brought, at vast expense, from Beaudesert House on the Welsh borders, which had been demolished. And the former cow byre was converted into the present dining room. In 1948, the Buxton family bought the house from the Whad-coats, and built on the delightful drawing room using local stone and tiles from a barn owned by friends. In 1960, the property was bought by the Hemsleys, whose much-loved family home it has been ever since. Were it not for Mrs Hemsley’s well-researched pocket history, it would take a house detective to unravel the true background of Langholm Lodge, so cleverly have the period materials been installed. This is a well-used family house, with a pretty staircase hall, three reception rooms, 10 bedrooms and three bath/shower rooms, which a new owner would no doubt wish to renovate and modernise. The stabling and various farm buildings also need upgrading, as does the former tennis court, but the gardens to the rear, created by Mrs Hemsley over the years, are a real delight. 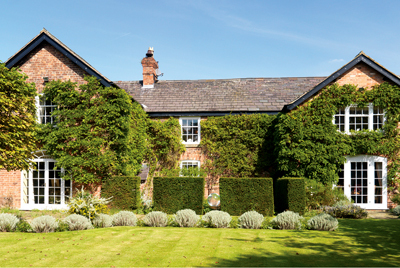 Langham Lodge is for sale as a whole through Bidwells (01223 559352) at a guide price of £3.8m.